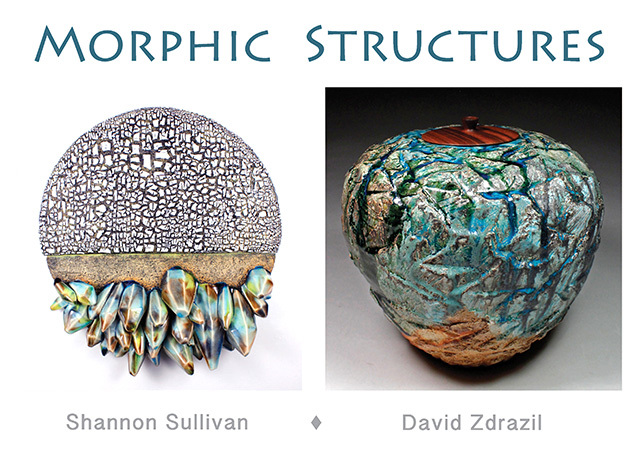 Humboldt State University's Third Street Gallery presents "Morphic Structures: Ceramic Works by Shannon Sullivan and David Zdrazil," a two-person exhibition of ceramic sculpture and ceramic vessels by artists Shannon Sullivan and David Zdrazil (pronounced DRAY-zel). The show runs April 1 through May 14. The objects in this exhibit reference a variety of phenomena found in the natural world. Geology, crumbling cliffs, stormy landscapes, and vibrant growth are among the shared references in the works made by Sullivan and Zdrazil. The artists use the ceramic process itself to link these environmental experiences with the objects they make. Clay and glazes transform between states of soft and flowing to dry and solid throughout the forming and firing process. The resulting pieces are a condensation of geologic time, enduring yet fragile. Shannon Sullivan’s ceramic sculptural discs are reminiscent of peering through a microscope onto specimen slides that might have mineral formations as well as biological structures. Her curiosity with micro imagery was born from growing up with her mother who worked in a medical lab. Images unseen by the naked eye that require closer investigation has been an inspiration in her work, which explores the nuances present in the living world. “The work asks the viewer to question their relationship with place” to evoke the feeling of intimacy with the world that surrounds us. Sullivan’s ceramic pieces have been included in the book “500 Ceramic Sculptures.” Her accomplishments also include having worked as an artist in residence in Jingdezhen, China, at the Pottery Workshop and at the International Ceramics Research Center in Skaelskor, Denmark. David Zdrazil’s work is a fusion of traditional and contemporary pottery styles from the East and West. His wood-fired ceramic vessels call upon geometric ratios, textures, historic processes and materials that Zdrazil has extracted from his surroundings. Sustainability plays a large role in his work, as he often makes use of locally found materials. He describes his work as “chunky style” in reference to the textures and masses he employs in his design as well as for the way he combines his materials. Zdrazil claims that “Truth to materials is a theme that is found throughout my work—the ‘clayness’ of the clay can be smooth, chunky, flowing, cracking, pure and unrefined all at once.” After building his first wood fire kiln in 2001 he has explored various aspects of kiln design, including hybrid and hydrogen fueled kilns. Zdrazil’s work has been presented in publications such as Luxe Interiors and Design, Ceramics Monthly, Ceramics Technical and The Log Book. Both from Wisconsin, Sullivan and Zdrazil have known each other since the late ’90s and have studied, worked, collaborated, and exhibited together extensively. Sullivan and Zdrazil’s work has been exhibited in galleries and museums nationally and internationally. They have presented at the National Council on Education for Ceramic Arts in the U.S. and at international conferences in France, Australia, Germany and Denmark. After many years of friendship, they were married in 2011. They both teach art at College of the Redwoods in Eureka, California where they share a studio at their home. Shannon Sullivan and David Zdrazil’s “Morphic Structures” is produced by Humboldt State University students. Students enrolled in the Art Museum and Gallery Practices Program participate in the daily management and planning of shows at the gallery. The gallery provides real-life opportunities for the students to develop their gallery and museum skills, which in turn provides them with experience that will help them to enter the job market. Many students who have participated in the program have gone on to careers in museums and galleries throughout the nation. A reception for the artists will be held at HSU Third Street Gallery on Saturday, April 1 from 6 to 9 p.m. during Eureka’s monthly Arts Alive program. The exhibition will run from April 1 through May 14. The gallery is open Tuesdays through Sundays from noon to 5 p.m. and is closed on Mondays. Humboldt State University Third Street Gallery is located at 416 Third Street Eureka, California. The gallery was recently relocated and renamed after 19 years in its former location on First Street in Eureka. For more information, call 707.443.6363 or visit the gallery’s website at www.humboldt.edu/first.